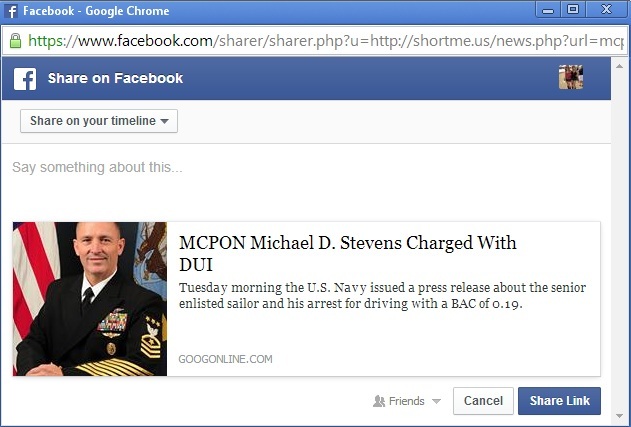 A fake story circulating on Facebook said the MCPON had been charged with a DUI. The fakery, shown here as a screen grab, appeared in many sailors’ news feeds. Internet trolls this week pranked the Navy’s top enlisted sailor, who took to his Facebook page to dispel social media rumors he’d been charged with drunk driving — at over two times the legal alcohol limit. Master Chief Petty Officer of the Navy (AW/NAC) Mike Stevens debunked the rumors Thursday, saying he had not been arrested for driving under the influence. I heard that there’s a prank going around on social media that involves me! No DUIs for me! I’m finishing my motorcycle safety course today and getting ready to visit our hard working Sailors in Boston! As it turns out, the rumor got started on Fakeshare.com, a site that lets users create fake news story links and then count the number of people who fall for them. So far this week they’ve started rumors that the Dodgers traded three of their best players and that Netflix cancelled season 3 of “Orange is the New Black,” among others. Drunk driving arrests have tarnished the careers of many officers and senior enlisted. Among the most recent: a CMC canned in June after not reporting a DUI arrest. If MCPON’s fake news didn’t end up in your feed, here‘s what you would have seen when you clicked the link. Meanwhile, the prankster is still at large. A gallery of fake news from Fakeshare.com that includes MCPON and other fake newsmakers. SCPO Ret, LT of Police, Ret……. Really good blog thank you very much for your effort in writing the posts.